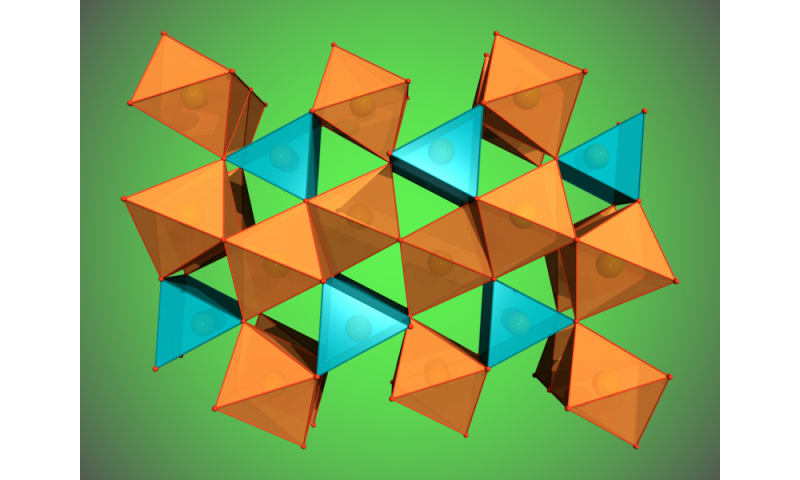 Using a special high-pressure chamber, scientists have discovered two new iron oxides in experiments at DESY's X-ray light source PETRA III and other facilities. The discovery points to a huge, hitherto unknown oxygen source in the lower mantle of the Earth. The team led by Dr. Elena Bykova from the University of Bayreuth reports its results in the scientific journal Nature Communications. Iron oxides in nature take on different forms. 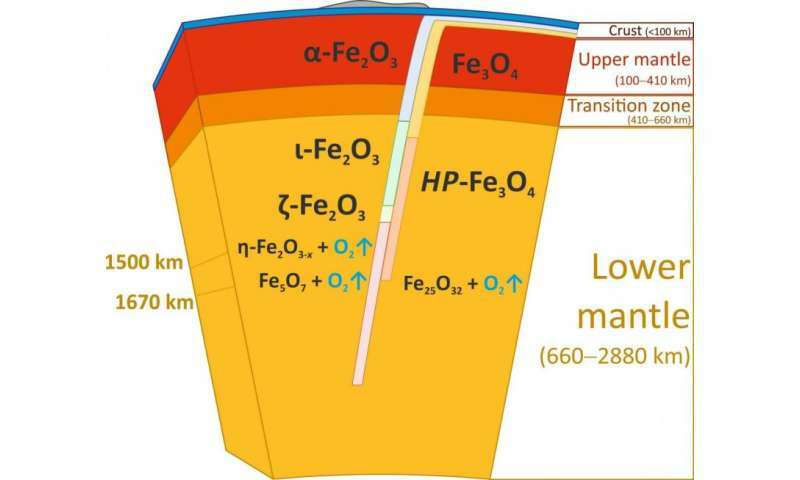 "The most common iron oxide is hematite, Fe2O3, which is the end product of many geological processes and the main source of iron for our civilization," explains Bykova. During the past five years, however, scientists have discovered other iron oxides like Fe4O5, Fe5O6, and Fe13O19 that form at high pressures and temperatures. Investigating the behaviour of hematite and magnetite (Fe3O4) further, Bykova and her colleagues used a special pressure chamber at DESY's measuring station for extreme conditions P02.2. "In this so-called diamond anvil cell, a minute sample can be compressed between two diamonds to several hundred thousand times the atmospheric pressure while a meticulously aligned laser can also heat the sample through the transparent diamond anvils to several thousand degrees Celsius," explains DESY scientist Dr. Hanns-Peter Liermann, head of the measuring station and a co-author of the paper. At the same time, the exceptionally bright and small X-ray beam of PETRA III can track structural changes in the sample. Similar measurements were also made at the European Synchrotron Radiation Source ESRF in France and at the Advanced Photon Source APS in the US. When the scientists applied a pressure of more than 67 gigapascals (about 670,000 times the standard atmospheric pressure) to their hematite samples and heated it to more than 2400 degrees Celsius, Fe2O3 decomposed and formed Fe5O7, an iron oxide that has not been seen before. These conditions correspond to roughly 1500 kilometres below the surface of the Earth. At an even higher pressure of 70 gigapascals, corresponding to about 1670 kilometres below the surface, magnetite decomposed and another new iron oxide formed, Fe25O32. The formation of both so far unknown compounds leads to the release of oxygen. 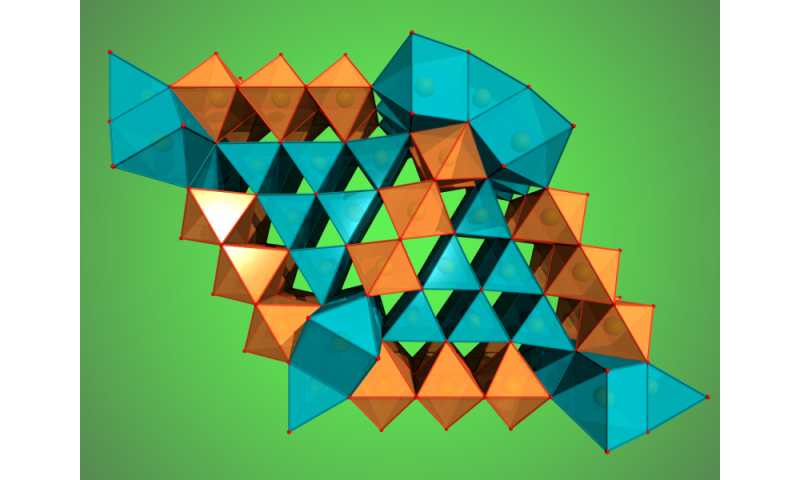 Although iron oxides do not normally exist in the bulk of the Earth' lower mantle, they can be transported there via subduction zones, where one tectonic plate dives under another. Hematite and magnetite are major components of so-called Banded Iron Formations (BIFs) and ironstones, huge sedimentary rock formations occurring on all continents. These formations may reach up to several hundred meters in thickness and hundreds of kilometres in length.Deposited in the world's oceans about two billions years ago, Banded Iron Formations form part of the ocean floor and are recycled into the Earth's interior by subduction to great depths, possibly extending to the core-mantle boundary region. As the team now observed, at conditions corresponding to the middle of the Earth's lower mantle hematite and magnetite decompose releasing huge amounts of oxygen-rich fluid (as oxygen is usually liquid under these conditions). "We estimate that this source so far provided an amount of oxygen equivalent to eight to ten times the mass of oxygen in the atmosphere," says Bykova. "That's a surprise, and it is not quite clear what happens with the oxygen down there." The oxygen-rich fluid could either locally oxidize surrounding materials or pass to the transition zone, or even to the upper mantle. "This remains to be explored", says co-author Dr. Maxim Bykov of the University of Bayreuth. "For now, we can only say that there is a huge source of oxygen in the mantle that can significantly affect geochemical processes by changing oxidation states and mobilizing trace elements. This will open a large new field of modelling." The discovery of the new iron oxides thus not only adds to the knowledge about fundamental characteristics of these substances, underlines Bykov. "Our work shows that we maybe miss significant parts of the processes in the Earth. Subducted slabs can apparently produce unexpected things. The effects on Earth's global dynamics, including climate variations, have to be investigated." Yes, very interesting. If the deep earth was the producer of the minerals like calcium and magnesium and manganese as evidenced by the life that immediately made use of these in the ocean, then the oxygen that formed the earth atmosphere could indeed have come from the core.